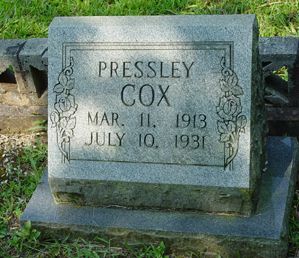 James Pressley Cox, son of William M. Cox and Malissa Hite. Mr. James Presley Cox, 19 years of age, died last Friday morning at seven o’clock after a three weeks illness at his home in the Center community. Although he had been ill for some time, his death came as a great shock to all who knew him. He was a devout Christian boy and was a member of the Center Baptist church for about three years. He was a young man loved by all who knew him and was the type of boy who made friends by kind deeds and words. He was always pleasant with all and he will be greatly missed. Funeral services were conducted Sunday morning at 11 o’clock at Macedonia. Rev. S.M. Smith conducted the services, assisted by Sandy Bennett and Rev. A.S. Massey, of Douglasville. The songs “Nothing but The Blood of Jesus” and “Sweet Bye and Bye,” were beautifully and touchingly rendered. Interment was in the Macedonia Cemetery. Surviving Mr. Cox, are his father and mother, Mr. and Mrs. W.M. Cox and the following brothers and sisters, Leroy Cox of Acworth, Nat, Chamblee, Wes and Harold Cox, and Mrs. Ben Woods and Misses Annie and Lotta Cox. Messers. Herbert Lewis, Cliff Bohannon, Lon Bohannon, Gold Johnson, Robert Hulsey and Ralph Knight, served as pallbearers. John W. Jones funeral directors, was in charge of arrangements. Sister Mrs. Ben Woods is Eva Cox.